The blender is one of those pieces of kitchen equipment that even the most casual of cooks needs every now and then. Liquidising ingredients for everything from soups to pancakes in seconds, it's a small appliance that's eternally useful, affordable and that doesn't take up much kitchen cupboard space. Check out our pick of the best blenders for your kitchen. If you're looking for more kitchen appliance recommendations, head over to our hub page. How will you be using your blender? If it's for your morning smoothie, it's best to go for a model geared towards that purpose, such as the Nutribullet 600 series. However, if you're looking for a blender to liquidise the ingredients for Yorkshire puddings or to mix a pancake batter, a more powerful model will be more suitable. High wattage models aren't always better, so be sure to check what the blender you've picked is best designed for. How many speeds does the blender have? Smoothies only? One speed is enough. However, if you'll be using your blender for all sorts of recipes, invest in a model that has a range of different speeds and settings, and look out for those with a pulse setting, an ice-crushing setting and a hot food mode. What is the size of the blender – both in relation to how much storage space you have for it and how much food it needs to cope with at a time? Most range from 0.5 litres to 1.5 litres; smaller ones are obviously best for making that single morning smoothie; larger models will be needed for tackling dinner party recipes. Are there any useful additional attachments, such as extra blades, or even extra cups for convenience? Are the blender cups and jugs BPA free, which is a must if you're conscious of your health? To read all about BPA plastics and why you should avoid them, visit HealthLine. If you’re starting out on your juicing (or smoothie) journey, then try this one out for size. Not only can you make your favourite drinks, you can grind coffee, blend together salad dressings and make your batter for the Sunday roast Yorkshire puddings. 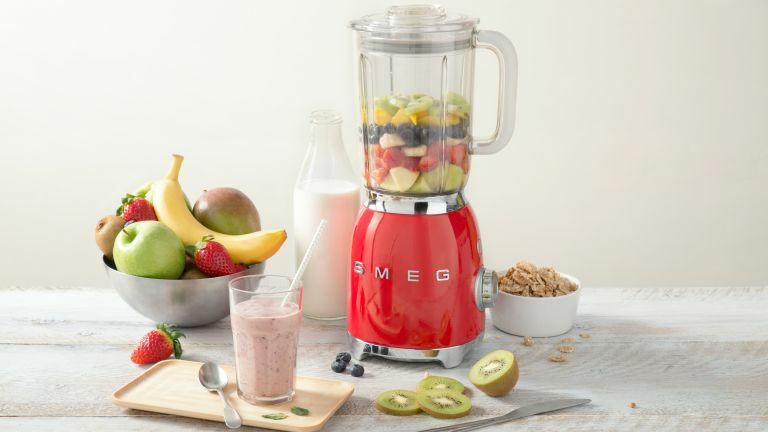 Because of its multi-functional use, the expression 'Jack of all trades, master of none' comes into it – so if you’re after a pro juicer or a pro coffee blender or a pro smoothie maker, don’t go for this. But for knocking out a healthy drink on your way out to work or on a sleepy Saturday morning, you can’t go wrong. A perfect entry-level blender that will blitz orange juice with heaps of pulp and double-up as food preparation gadget when juices are out of season. In our opinion, this is the very best blender you can buy. Much of the food we eat doesn’t naturally release the full extent of its nutritional value but with the help of this powerful blender, you can make sure whole foods and seeds are completely broken down to extract their full potential. In addition to this, the blender has several settings, including smoothie, blend, ultra blend and food puree. So whether you’re blending the evening’s dinner into something consumable for your baby or creating a delicious smoothie with lots of lovely ingredients, the power of the Nutri Ninja will blend down the toughest of veg and fruit into the ideal smoothie. The best blender for making drinks such as milkshakes and smoothies, the Nutribullet 600 can liquidise fruit, nuts, ice, vegetables, seeds and much more. A good purchase if you're making smoothies and other drinks mostly just for yourself, as it has a small-ish capacity of 0.7 litres. However, this does mean it will fit nicely on your kitchen worktop or in your cupboard. While the fact that it only has one setting may be a disadvantage for some, it does mean that your job will be made easier as there'll be no faffing switching between speeds – you just press the button until your ingredients are liquidised. For nutrient-rich drinks with no unwanted lumps, there really is no better option. Looking for a blender for making soups, pasta sauces, or baby food? This KitchenAid Diamond Blender has a special hot food setting to avoid any mishaps when it comes to liquidising hot food (spoiler alert: it'll just explode in a normal blender) and thanks to the Intelli-Speed control feature, the blending speed will automatically adjust to suit the texture of your food. With a 1.75 litre capacity, it'll be able to make enough servings for the entire family, and you may even have some leftover. It's made from a die-cast metal base, meaning it's robust and is built to last, and it has six settings in total, as well as a pulse button. It'll look great on your worktop, and it comes in black, red or cream to suit your interior scheme. Sturdy and stylish, the Smeg BLF01SVUK is the ultimate kitchen appliance for those who are looking for the best blender for families. It can liquidise just about anything, including ice. It's made from die-cast aluminium and has anti-slip feet, making it a sturdy find. It's a lightweight appliance, despite its sturdiness. It has four speed settings, as well as pre-set programmes for ice crushing and smoothie making. The jug itself is BPA free, and it has handy measurements on the side for a little helping hand when you're cooking. This is our top pick for the best family-friendly blender for your kitchen. Featuring one-touch operation, the Breville Blend Active is the best blender for those who are looking for something easy to use. Its blade can cut through everything from ice to nuts, seeds and frozen fruit, and it comes with two dishwasher safe and BPA free cups. Since it has just one button, it has one speed setting. Press and hold the button until your food is blended to the right consistency then remove the bottle from the blender, swap the blade to the bottle lid and you're off. Not only is it easy to use, but thanks to the fact it has dishwasher safe parts, it's easy to clean too.